If you’re a runner you’ve probably experienced foot pain. If you’re not a runner, you probably will at some point in your running career. Running is good for your health, but it can cause foot problems and other problems in your body that you may have never thought of. The good news is there are treatments that can help. Plantar fasciitis – an inflammation of the plantar fascia, which is the thick band of tissue that runs along the bottom of the foot from your heel to your toes. It can happen without any obvious reason, but high activity could lead to it, or people with a high arch are sometimes more prone to it. Achilles tendonitis – your Achilles tendon is the large muscle that attaches the calf to the back of the heel. The inflammation and pain is usually caused by too much stress put on the tendon. Ankle sprains – this happens when your ligaments surrounding the ankle stretch or tear. It often happens when the foot twists or rolls inward. Chafing – This probably isn’t top of mind when thinking about running, but it can be a problem. Especially between your thighs, waistbands or sports bra bands, where your shoe meets your ankle, or any other area that causes skin-on-skin friction or friction from clothing. IT (Iliotibial) Band Syndrome – this band is a ligament that runs along the outside of your thigh from the top of the hip to the outside of the knee. It helps stabilize the knee while running. When it thickens, it can rub against the knee bone and cause painful inflammation. 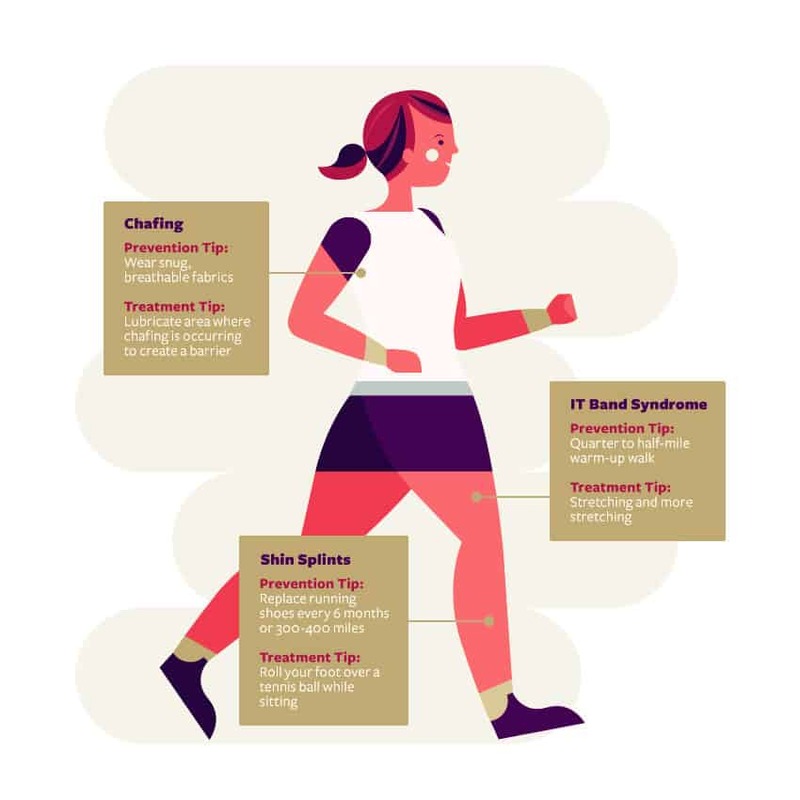 Shin Splints – these are caused by pain or stiffness in the your shins, often because your strong calf muscles are pulling on your weaker shin muscles. They are often caused by ramping up your workout intensity or running distance, or changing the surface you’re used to running on. You’ll find a lot of conservative treatment options like stretching, icing, resting, over-the-counter pain medications, changing foot wear, etc. will help these issues, but you will eventually need something more permanent. Running will inevitably cause you foot pain at some point. The key is to address the pain if it keeps getting worse. Adler Footcare offers a remarkable treatment called HyProCure that helps children and adults experiencing chronic foot pain and pain in other areas of the body related to the foot pain. It works by inserting a stent into the natural space between the ankle bone and heel bone to prevent the ankle bone from rolling inward. This stops or dramatically decreases the excessive motion causing the pain. The procedure uses a minimally invasive technique, which means it’s done by making a very small incision. The procedure causes little to no pain and within 3 to 5 days patients are walking in their own shoes again. If you’d like to learn more about how HyProCure treatment can help you download our free offer below OR contact a New York podiatrist at Adler Footcare to have your foot pain evaluated. We believe feet shouldn’t hurt and neither should their treatment.